Cycling specific Pilates Courses are available – please contact charlotte@live-pilates.co.uk or call me on 07801 444825 to discuss your club/individual needs. Cycling is a healthy cardio vascular sport where you can become fit relatively quickly. However, when you sit on a bike – which lets face it is not ergonomically designed – you hold an awkward position for a sustained period of time, which results in poor posture. So how can Pilates make you stronger on the bike? By strengthening the stabilising muscles the mobilising muscles work better and balance is restored, therefore, optimising a cyclist’s performance and competitive capacity. Pilates is beneficial to help restore postural alignment, shift the spine back into position, open up the chest, ease and prevent back pain and relieve the tension caused by sitting for long periods in a mechanically unsound position. Professional cyclist Levi Leipheimer doesn’t work in the gym lifting weights. “I do Pilates,” he said. Leipheimer was doing two one-hour sessions a week in his pre-season buildup. “It’s unbelievably hard,” he said. “It uses all these little muscles that you don’t realize. It’s just about your body being in alignment and balanced and square — something you definitely need on a bike. Being in one position like that is not how we’re designed, and things start to deteriorate…. “I always like the way I feel when I leave a Pilates session. 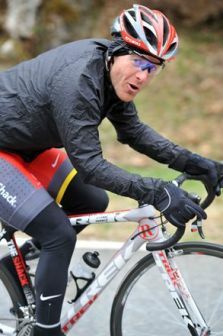 I just feel like I’m straight, standing erect.” And that’s important for Leipheimer who has often had back problems, the result of a ski accident that fractured some vertebrae in 1991 and a mass pileup in stage 1 of the 2003 Tour de France that broke his sit bone. Charlotte Hopkinson – in her racing days!